LEAWOOD, KS (September 15, 2015) – CARSTAR Auto Body Repair Experts is revving up the horsepower this year by sponsoring a boat in the H1 Unlimited Hydroplane boat racing series. The CARSTAR Puget Sound Business Group put together the sponsorship of the boat, which is piloted by CARSTAR Collision Specialties II employee Kevin Eacret. Eacret has been racing boats for the past decade. He started his racing career in the stock 4-cylendar class, then moved up to stock V-8, before moving into blown alcohol big block boats. This is his first season running in the H1 Unlimited class, which features the biggest and fastest boats in the world. Eacret’s Unlimited Hydroplane is powered by a Lycoming T-55/L7 Turbine engine out of a Chinook helicopter. The engine produces 3,000 horsepower, and will reach speeds of 200 mph on the 2 to 2.5-mile oval tracks on which the series races. The race team, which was founded by boat racing legend Fred Leland, has seen quite a bit of success this season. With just one race left on the schedule, Eacret is currently in the top 10 of the series point standings. They are coming off of their best event to date in Detroit, MI, where Eacret raced to three top 3 finishes, including one heat race win. 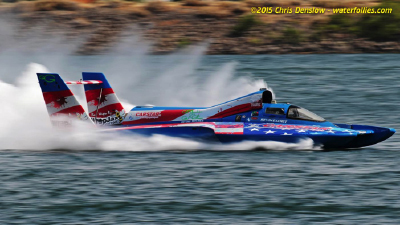 With two races on the schedule in Washington State, and with an event attendance of 150,000-200,000 spectators, it made sense for the CARSTAR Puget Sound Business Group to sponsor the boat. It also made for the perfect tie-in having a CARSTAR employee in the cockpit. Eacret and his Leland Unlimited team will look to improve on their performance in season finale, which is scheduled for September 18-20 in San Diego, CA. Kevin Eacret celebrates his first heat race win in Detroit, MI.